We do accept GP referrals but it is not necessary. Your GP may suggest you have some physiotherapy but you do not need a referral or even visit your GP before coming to see us. We may, with your permission, contact your GP to inform them of your treatment with us or for any onward discussions with them that we feel you may benefit from. If you have booked in with one of our musculoskeletal physiotherapists your initial appointment will take around 45 minutes. Follow ups are usually 30 minutes but your physiotherapist will discuss with you any differences to this. 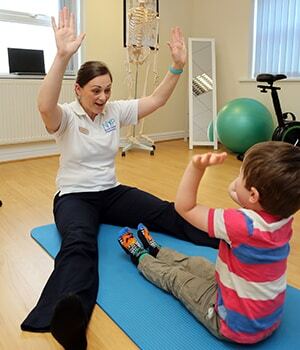 Our neuorological physiotherapy initial assessments are one hour with follow ups ranging from 30 – 60 minutes. Women’s health appointments are 45 minutes for initial assessment and 30 minute follow ups. Your physiotherapist will need to see the area of your complaint as well as areas above and below so you will need to be prepared to be asked to undress. It is a good idea to bring a pair of shorts for any leg problems and for back related conditions. Please be assured our clinic rooms are all sealed off and private. This will depend on your condition and what the physiotherapist finds on their assessment. They will discuss with you at the end of your initial assessment how many sessions they predict you will need, though this may alter depending on how you respond to treatment. We do aim to get you better as quickly as possible with our clients achieving their goals in an average of 5 sessions. This really depends on your condition and what your physiotherapist diagnoses following your assessment. They will discuss this with you at the end of your assessment. Can someone accompany me into my appointment? Of course! Please inform your physiotherapist at the start of your appointment that you would like someone to accompany you and please let your physiotherapist know their realtionship to you. Can I specifically request a male/female physio? We have male musculoskeletal physios, Dallas and Alan. Kate and Hannah are our female musculoskeletal physios. You may request to see whomever you’d prefer. At present, we have a female neurological physio, Charlotte. Yes, we accept all major credit and debit cards. We also accept cash, cheques and payments by BACS. Can I use my health insurance with you? We are registered with Bupa, Aviva, Pru Health, CS Healthcare, Exeter Friendly, AXA PPP, Nuffield and Cigna. If your health care provider is not listed please contact us to see if you can be seen by one of our team. You can find us on the Bupa Finder profile site here. What happens if I don’t get better with physio? In some cases physio is not enough to resolve your condition. If this is the case we will aim to decide this as soon as possible and discuss with you futher treatment options. This may take the form of discussions with your GP the possibility of an injection or referral for an orthopaedic opinion and/or scan. This can be done via our Surgical colleagues or via your health insurance. What times are your appointments? We have flexible appointments, starting at 8.15am and running until 8pm as well as Saturday morning appointments. Your physiotherapist will ask you a few qusetions about your condition, including how it started, how long you’ve had it and aggravating and relieving factors. They will also need to know about any other medical conditions and medications you may take. They will then assess you and devise a treatment programme and goals which they will discuss with you. Your treatment will begin at your first visit and you may well be provided with your individualised exercise programme o continue your rehabilitation at home between appointments. Will I always see the same physio? You will be assigned your physio for your treatment regime but there may be times when your physio is on leave and your appointment is with one of our other skilled physios. If this happens you will be informed. If you would like to change your physio at any time, please don’t hesitate to request it. Can I contact you between appointments? Of course you can. Please see our contact us page for all our details. Our physios will get back in contact with you as soon as they can.